On behalf of the SA, Gitlin advocated for finding ways to increase and continually measure improvements to campus safety, including more support for a night campus shuttle; he also advocated for hiring an associate dean for the LGBTQ Resource Center in the Office of the Dean of Students. Mitch Paine, Graduate and Professional Student Assembly (GPSA) president, reported that the GPSA passed a resolution this year that supports women’s professional development and asked for additional programming and resources for women to navigate the world of academia and careers. He reported that the GPSA recently passed its strategic plan, the Graduate Professional Community Initiative. 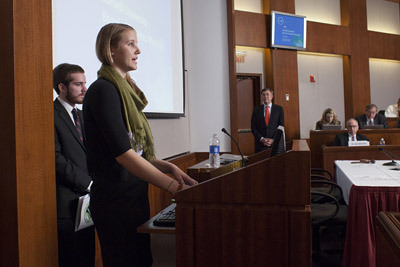 The plan, created collaboratively with hundreds of graduate and professional students, comprises eight topics with objectives and action items, including a graduate and professional student center, career resources, mental health and physical well-being, diversity, international students, family services, housing and community. It was made as a “truly strategic plan” with hundreds of action statements, said Paine. The meeting began with a presentation by State University of New York (SUNY) Chairman of the Board H. Carl McCall, who discussed Cornell’s and SUNY’s historic collaborations. He discussed how SUNY helps fund the Cornell statutory colleges — Agriculture and Life Sciences, Human Ecology, ILR and Veterinary Medicine — with total support of more than $121 million from the $12 billion total SUNY budget last year. McCall outlined SUNY’s strategic plan “that was rooted in six big ideas”: involvement in entrepreneurial activity, the education pipeline, serving as a resource for sustainability projects, providing for the health of communities, expanding SUNY’s global reach, and engaging and enriching communities, he said. Educational remediation for K-12 students to prepare them properly for college was an important priority for SUNY, he said. He also called for collaboration between Cornell and SUNY for online education programs, advocacy for funding of state and federal grants, research, and the Cornell NYC Tech campus.